I had a medical the other day. As if almost feinting during the blood test wasn't bad enough, I received an email shortly afterwards - "Dear Mr Fishbiscuits, the results show that you have raised cholesterol". I'm sure this will come as no more of a surprise to you than it did to me, given some of the stuff I shove into my gob. But Christmas is not the time of year to be worrying about weight, cholesterol, and blood pressure. It is a time for indulgence, a time to spoil yourself after another year at the grindstone. Salads, gym, and the general abstinence from pleasure can wait until January. 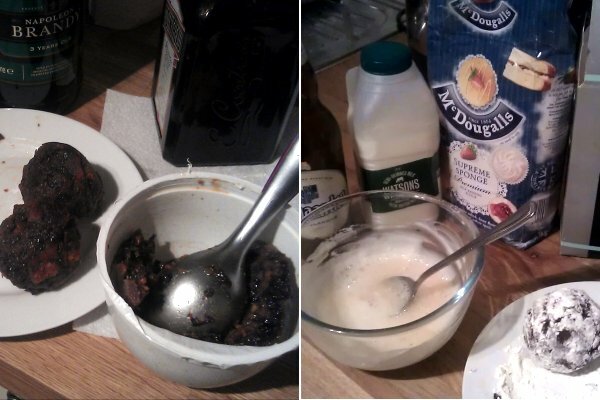 So, concentrating firmly on the present, no dish embodies Christmas indulgence quite like the Christmas pudding does. Thick, dense, rich, sweet, spicy, fatty, reeking of alcohol, and containing half* of our normal daily calories in a single slice, it is regarded throughout the rest of the world as an eccentric (and even unpleasant) British oddity... a medieval legacy that has somehow survived into modern times. It is frankly remarkable that we can squeeze it in after a full roast with all the trimmings. 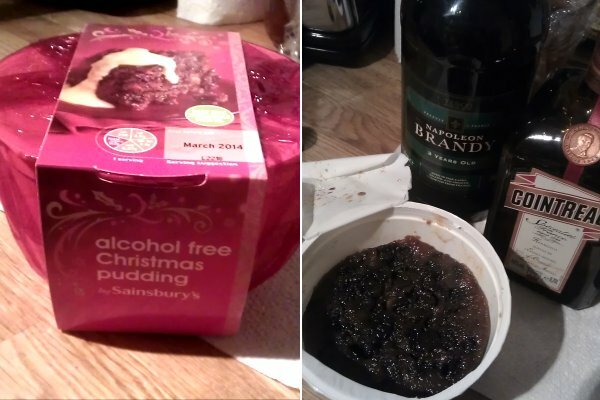 But I love Christmas pudding. And it is the perfect candidate for my final deep-fried installation of 2012. The traditional home made Fishbiscuit family pudding is a wondrous thing, but unable to procure one, I had to settle for a shop bought version. It smelled OK, but not boozy enough. I looked at the packet again... disaster! I had bought an "alcohol free" pudding! So I poured some brandy (Tesco own brand... nice) and Cointreau over the top, and stabbed it repeatedly with a skewer to allow the booze to soak in. After a few minutes, I fashioned two large balls of pudding. I had limited success with an ice cream scoop, so I ended up rolling them between my hands, until I had two balls. Big. Sticky. Smelly. Balls. The batter is my tried-and-tested recipe of self raising flour, cornflour, milk, and beer. Cheap lager would be fine, but I used Hoegaarden, because I thought it might be nice to drink the remainder. 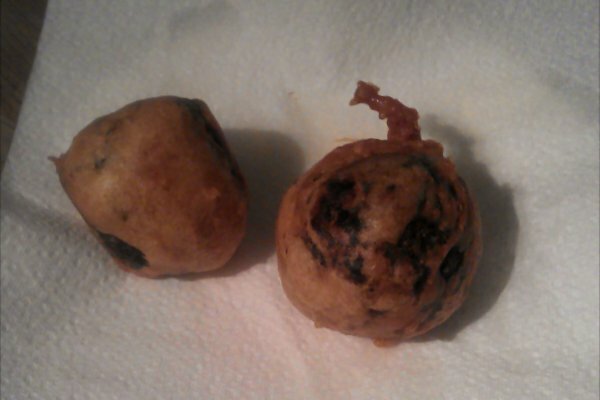 I rolled the balls-o-pudding in flour, before dunking into the batter. I'm pretty sure this stuff comes already cooked, but nevertheless, these are pretty big chunks of pudding which take a while to heat through. 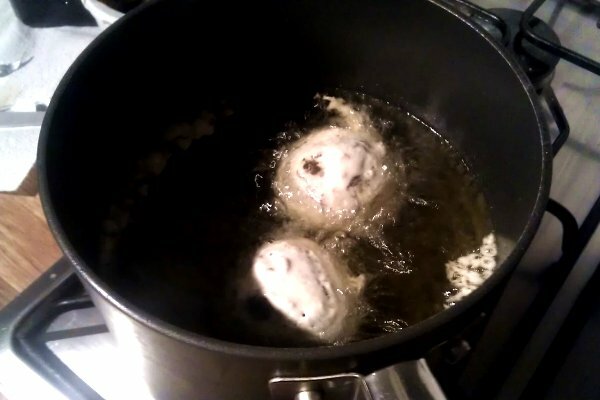 So unlike my previous high-temperate frying exploits, these needed to be fried at a moderate temperature for a longer duration. The batter did not puff up that much, and I am assuming that this was because of the lower temperature. But even so, the batter formed a satisfyingly crunchy crust around the pudding. 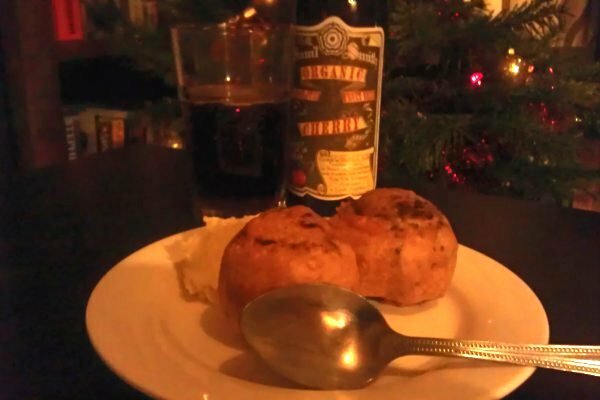 Obviously you have to have brandy butter (or "hard sauce", as our American friends call it for some strange reason) with Christmas pudding. 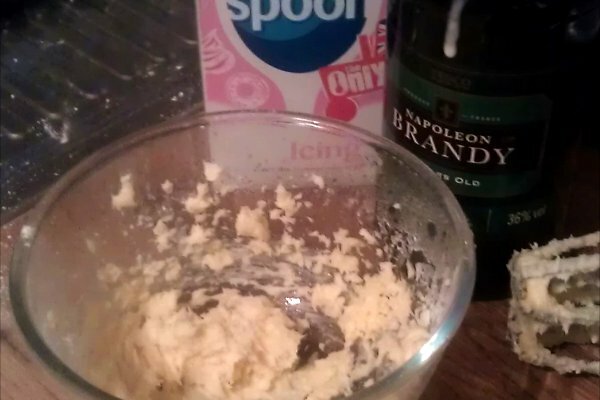 So I whipped up some butter with a glug of brandy and some icing sugar. And if the doctor doesn't like it, she can shove it! *probably not accurate... I'm not a dietitian, OK?